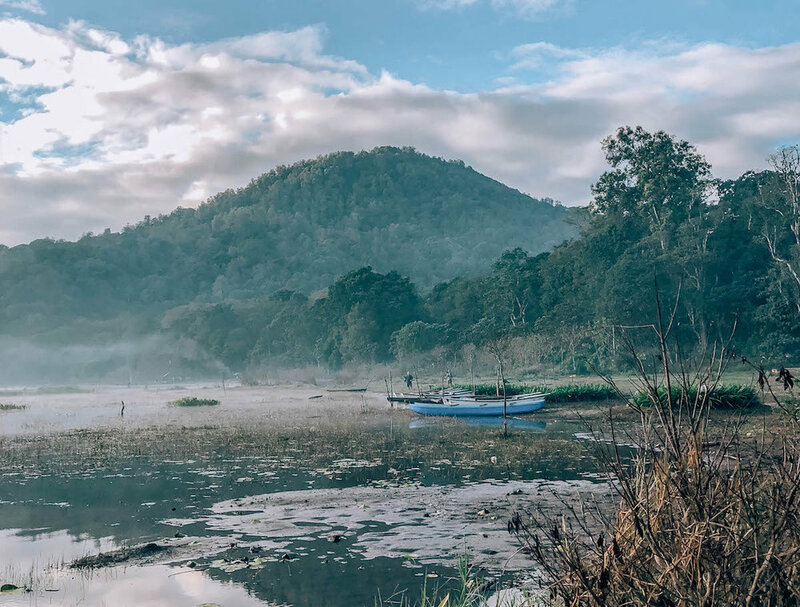 From waterfalls to lake temples to hot springs, you'll find all of my favorite spots and useful tips for your trip in this North Bali Guide. While on much of the island of Bali you’ll find trendy Western cafes, hoards of expats, and chaotic traffic, North Bali remains a bit untouched. (At least for now.) 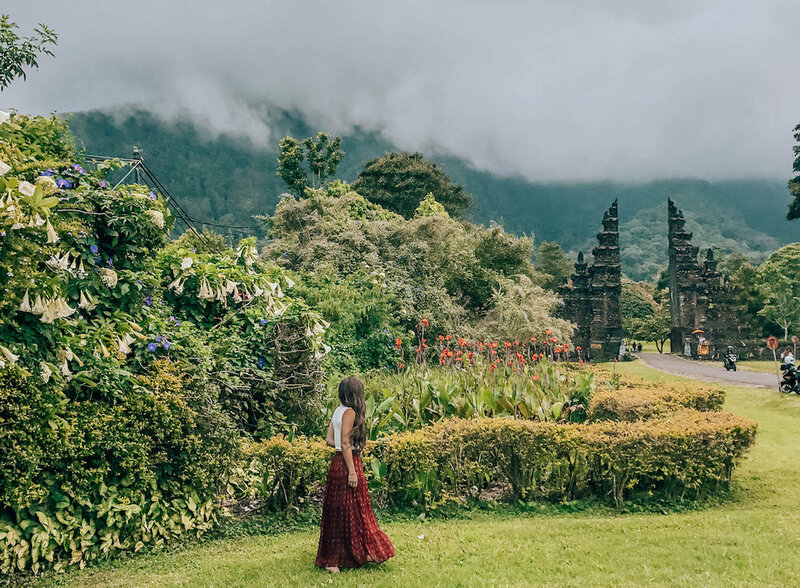 Lush jungle waterfalls, ancient water temples, therapeutic hot springs, and Insta-famous selfie spots are just some of the reasons why you should visit North Bali. Use this North Bali Guide to help plan your visit and to find my favorite spots. Although it’s accessible for a day trip from Ubud or Seminyak, I recommend hiring a driver and spending at least three days exploring all that the North Island has to offer. The town of Munduk is great base for your adventures. From here you can access the best waterfalls, temples, hot springs, and Insta-famous photo spots. This guide to North Bali will give you tips on what to see and do, where to stay and eat, and other useful tips for your trip. Perhaps my favorite thing about North Bali is its waterfalls. Not that there aren’t lovely falls all over the island, but there’s something about the chilly climate and untouched jungle wilderness in the north that makes it the ideal destination for waterfall chasing. Most will charge a small fee (about 5,000-20,000 IDR) for entry, so bring small bills. In North Bali you’ll find an impressive variety of waterfalls, from powerful giants to small, intimate spots that only locals know about. There are probably hundreds from which to choose. I recommend going to them all, but if that doesn’t work with your schedule, here are some of my favorites. Git Git is actually a series of three different cascades located just 30 minutes north of Munduk. Not all of the falls are open for swimming, but the top two cascades are great spots to take a dip in the cold, pristine pools of water. Depending on where you park and which fall you’re visiting, expect about a 20-minute, easy hike down to the water. When I first visited, Git Git hadn’t gained quite as much popularity so I had the place basically to myself. However, it’s now widely known as one of the most beautiful waterfalls in Bali, so lots of tourists make the trip there. You’ll probably be able to avoid some of the crowds by arriving early in the morning. Banyumala is one of my favorite waterfalls in all of Bali. It's lesser-known and therefore quieter, despite its impressive size and beauty. Although technically a twin cascade, there are actually endless tiny waterfall streams cascading down a 35-meter leaf-covered rock wall. You’ll feel like you’ve been transported straight to a magical scene from Avatar. This waterfall is also about 30 minutes from central Munduk. If you have a scooter or medium sized vehicle, you can drive along the one-way road to a parking lot located my closer to the waterfall. If you are in a large van or a low-bearing car, you may need to park further up the road. If you can’t traverse the road, be prepared to add an additional 15 minute to your hike, each way. At the second parking lot closer to the falls, there is a small cafe where you can sit outside and enjoy tea and a light meal. If it works with your schedule, consider stopping here to support the local community. Hiking down to Banyumala is a bit more challenging, although still doable in around 20 minutes wearing sandals. However, I’d definitely recommend some proper walking shoes, or at least sandals that securely attach to your feet. The hike to the waterfall will take you through some of the prettiest gardens imaginable: bushes of red and pink and purple flowers, fields of dusty blue hydrangeas, all against a backdrop of wild jungle greenery. The way back to the parking lot is equally pretty but significantly more exhausting. Bring water. Eventually, after ducking around a narrow rock wall trickling with streams of water, you’ll emerge onto flat ground overlooking the massive twin waterfalls. There are areas to lounge about or even have a picnic, or just make your way down to the pool and go for a dip. This is a great place to come for the day with friends, switching between sunbathing and swimming and picnicking. Sounds good, eh? I visited around 9:00am one morning and it was deserted. But as I was leaving around 11:15am, there were several other groups heading down to the waterfall, so arrive early if you want more privacy. Munduk Waterfall, just a minute drive from central Munduk, is easily accessible via a steep but short climb from the main road. It’s smaller than the others, at 15 meters, but is still lovely and more easily accessible. Hike down through the jungle and along a small river to arrive at Air Terjun Munduk. The setting feels impossibly perfect: a single cascade of icy water spilling into a clear pool of water, with dozens of tiny birds darting this way and that, skimming the surface of the water with impressive accuracy. Most people who come here will stop on the dirt just before the waterfall pool for a photo and then leave. So, there’s a good chance you’ll have the pool to yourself if you want to stay and swim. If you have time, you can also trek a bit in the opposite direction of the waterfall toward the little village of Munduk. The path will take you across a little bamboo bridge and through the jungle. If you have time to spare, it’s a beautiful path and an interesting adventure. I've yet to visit this waterfall, but it's at the top of my list. Although it's quite a long drive away from Munduk, I included Sekumpul on this list because it's a favorite among adventurous expats, and is one of the most impressive falls in North Bali. Sekumpul is actually a grouping of six or seven narrow, 80-meter tall cascades set amidst a bamboo forest. It is the most difficult to access on this list, which also means that it's a bit hidden from most tourists. The drive to Sekumpul is about an hour from Munduk. Once you arrive, you'll need to make a rather difficult trek to the fall, through streams and coffee plantations and dirt paths. The hike takes at least 40 minutes and definitely requires proper sneakers or walking shoes. If you have the time, though, I would definitely recommend making the trip to see this magnificent fall. Balinese Hinduism is largely centered around water. You’ll find the element incorporated into ceremonies and daily offerings, and even as the foundation on which sacred temples are built. 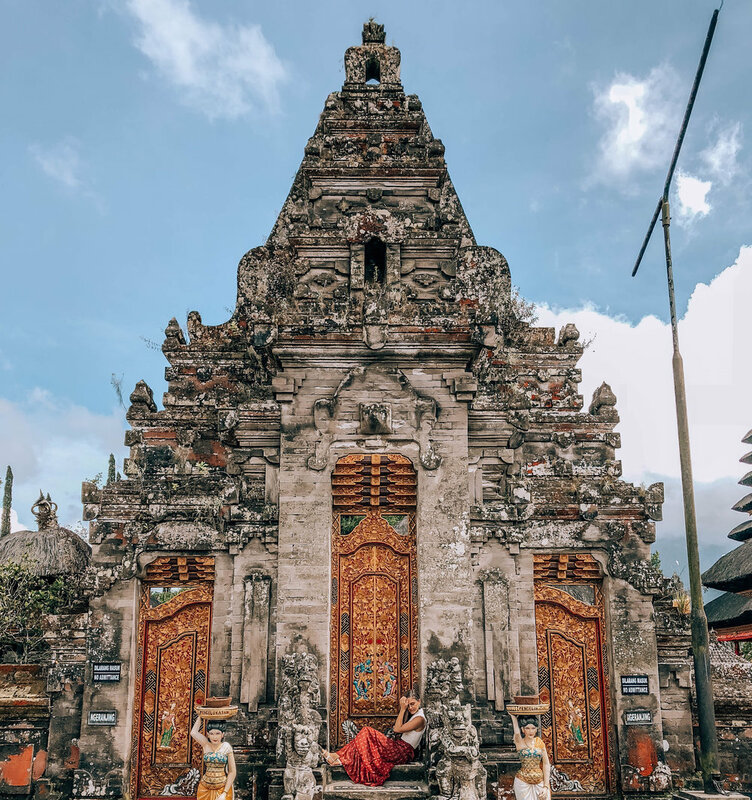 You can’t leave Bali without visiting one of these water temples, and thankfully, two of my favorites are right here in North Bali. Sitting atop Lake Bratan amongst the Bedugal mountains, Ulun Danu Beratan Temple’s surroundings are truly as scenic as the temple itself. Tour the temple grounds, which includes gardens, intricately carved gold gates, and large painted figures resembling tigers and various fruits (all rooted in religious symbolism). On the water itself, you’ll find the temple center and some rentable boats for paddling around. This is one of the more famous temples in Bali, so there will be quite a few other tourists there. But thankfully the temple is rather large, giving you plenty of room to roam away from the crowds. And regardless, it’s stunning, educational, and conveniently located, so you should pay it a visit anyway. Not for the faint of heart of the weak of stomach, the Lake Tamblingan Water Temple is a treasure you’ll have to earn. It’s situated at the bottom of Mount Lesung on the surface of Lake Tamblingan, the smallest of the three caldera lakes. Driving down Mount Lesung involves lots of winding road. Take car sickness medication in advance, even if you don’t normally get car sick. Expect 20 minutes of winding, narrow roads before reaching the Lake Tamblingan shore. Because this temple is a bit more difficult to access and is not developed for tourism, you will have more privacy. In fact, this area is protected from development so, hopefully, the site will remain untouched in its simple beauty. The best time to visit is for sunrise (arrive by 6:00am to get the full experience) when the sky lights up and reflects off of the still lake surface. You can rent a small canoe from one of the locals there who will take you around the lake for a small fee. When I visited for sunrise, there were about a dozen other photographers there who had set up their equipment when it was still dark. However, the photographers who come here really are there only to photograph the sunrise, so most likely they’ll be quiet and still, and you’ll hardly notice them at all. Note that the climate in this area is chillier and wetter than the rest of Bali, so it is possible that instead of a sunrise you’ll just get lots and lots of fog. In my opinion, it’s still beautiful with the fog, but just manage your expectations to be sure you aren’t disappointed if weather isn’t ideal. More officially known as Air Panas or Banjar Hot Springs, these centuries-old hot springs are a must-see in North Bali. Accessing them is a bit of a trek, as they are located about an hour’s drive north of Munduk (this drive is also very windy, so again, be sure to take car sickness medication). However, once you arrive, it’s 100% relaxation. The waters of Banjar have volcanic origins with create both the heat and the high sulfuric content of the spring water. It is this sulfur content that gives the springs their renowned therapeutic properties, known for curing skin and rheumatic ailments. During World War II, the Japanese, which occupied Indonesia, learned of the springs’ healing effects and further developed the site into much of what we see today. The springs have been organized into two tiered pools set against a backdrop of thick green jungle. Overlooking each tier are several stone dragons spouting steamy water into the pool below. There is also a small restaurant overlooking the springs for you to enjoy lunch or a Bintang. You’ll find changing rooms and bathrooms located on site as well, but they’re poorly maintained and not particularly sanitary, so you might want to take care of business before getting to the springs. And to answer your question: no, the pools don’t smell awful. Expect fresh jungle air and soothing and warm (albeit strangely yellowish in color) water. The minute you step foot in Bali you'll probably realize it's set up to be one massive Instagram island Mecca. Of course, this is largely because the island itself is naturally stunning, and you'll want to take photos everywhere you go. But certain spots on the island have become famous on Instagram for their photo-worthy backdrops. Two of the most iconic Bali photo spots are located in North Bali, so it will be easy to pay them both a visit while there. You may have seen the famous North Bali bamboo nests on Instagram, and if you haven’t, I’m honestly impressed. Either way, the little photograph-friendly adult playgrounds are fun places to take a break and get some great photos with friends. The selfie spots are situated on the side of the main road, Jl. 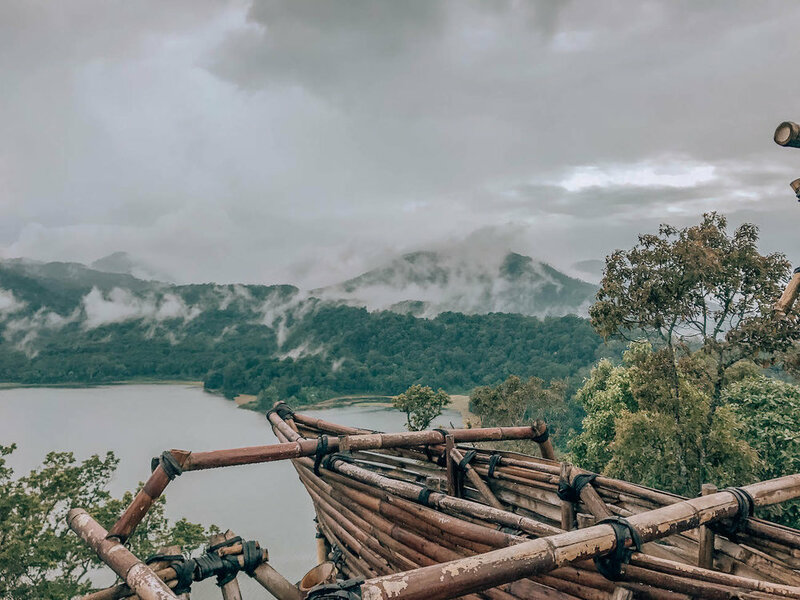 Raya Wanagiri, overlooking Lake Beratan and the surrounding mountains, so the views really are stunning. Even in the fog, it’s magical. 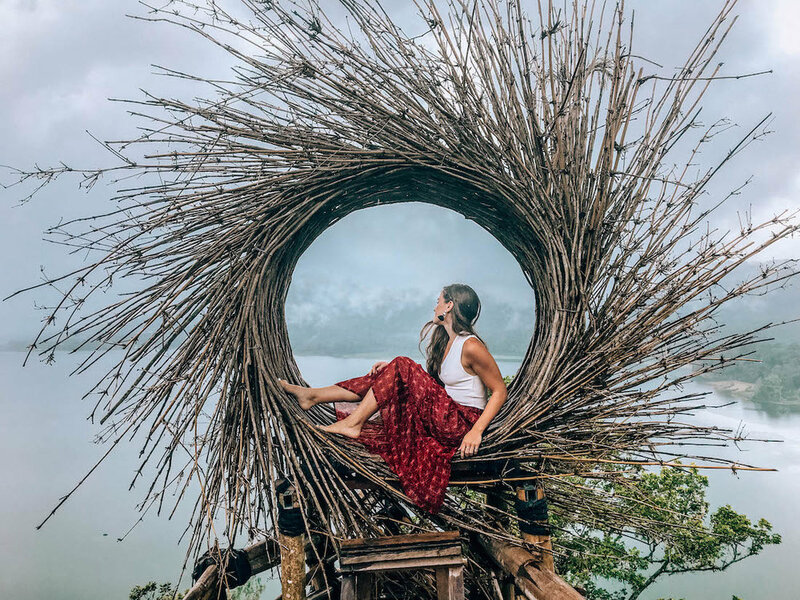 Drive along the cliffside road to find dozens of large, unique woven bamboo structures resembling birds’ nests, egg-shaped pods, hamster wheels, and other figures. You can climb into the bamboo structures for photos or to just soak in the views of the lake. There are also a few swings that have recently been added in response to the Bali swing Instagram-craze. One popular spot is Wanagiri Hidden Hills. 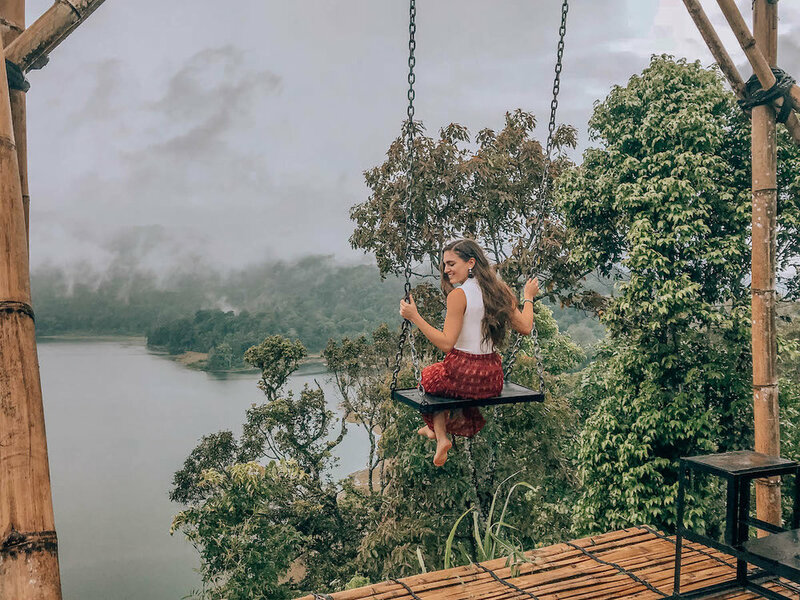 However, thanks to the Instagram sensationalism, many of the selfie spots, such as Wanagiri, have recently increased their prices from around 10,000 IDR to 100,000 IDR. Among the selfie spots are several little sitting areas where you can enjoy a meal or tea overlooking the lake and canyon below. Although I have no idea what its proper name is, if you ask for the "selfie spot with the snake," right next to the snake spot is a decent food option with banana pancakes and fresh squeezed mango juice. I’d encourage you to forego all the photos with animals next door, as this is not particularly ethical. It is, however, a convenient landmark to help find the restaurant, as it’s the only spot with a giant snake. Go figure. If the bamboo selfie spots haven't crossed your Instagram feed yet, my guess is these famous gates have. This towering, carved stone candi bentar, or split gateway, can be found in the town of Bedugal, about 30 minutes outside of Munduk. The gateway, which leads to the Handara Golf Resort, is one of the most iconic photo spots in Bali. The view of the massive stone gates with lush and misty green forest in the background really is like something from another world. It's dubbed the "pathway to serenity" for a reason. 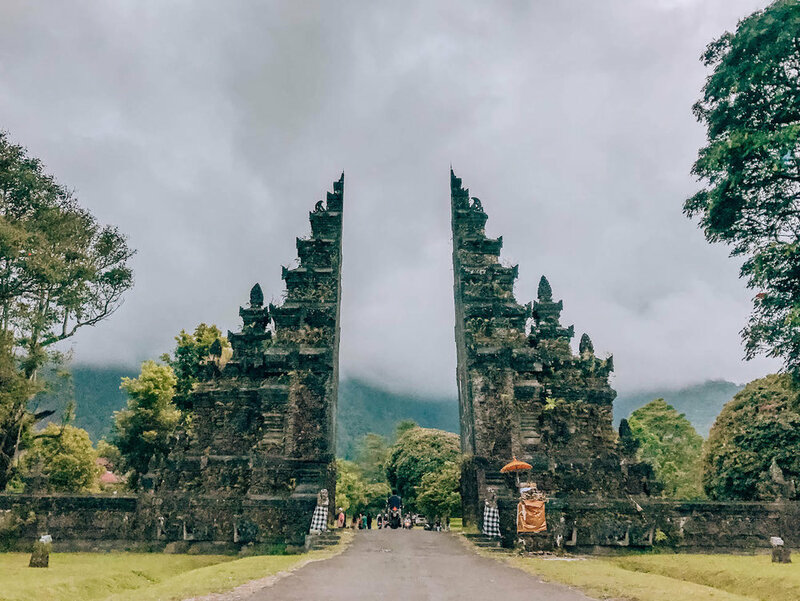 For some background, candi bentar are iconic gateways that can be found throughout Indonesia, usually leading to religious sites. They date back to the 13th century, largely concentrated in Java, Bali, and Lombok. Now, the Indonesian government encourages the construction of these gates as a form of regional identity. So now, you'll find them all over the island: as entrances to homes, airports, civic buildings, and, in this case, a golf resort. It's easy to miss these gates along the side of the road, so keep an eye out for signs indicating Handara Golf Resort. The specific address is: Desa Singaraja-Denpasar, Pancasari, Sukasada, Pancasari, Buleleng, Kabupaten Buleleng, Bali 81161 (you can find it on Google maps here). Like the bamboo selfie spots, because the gates have become so Insta-famous, the resort now charges 20,000 IDR for photos. I've heard stories about long queues, but every time I've driven by during the day, it's pretty empty. But if you're worried, head there just after sunrise. At around 7am, you'll get the best lighting and likely won't have to pay. Despite my general love for Balinese food, Munduk is certainly not a culinary Mecca. Because the area isn’t developed much for tourism, you’ll mostly find small warnings and kiosks selling street food. There are a couple of nicer hotels in the area, but they make it difficult for non-quests to visit for meals, by either denying visitors altogether, or charging excessive prices and setting strict time limits. However, there are several spots where you can enjoy a delicious meal in a beautiful setting for affordable prices. But note that almost all restaurants (including warungs) in the area close early, so plan for an early dinner (around 5:00pm) if you don’t want to be stuck with street food. Overlooking endless fields of dusty blue and purple hyndrangeas with rolling hills in the distance, this restaurant runs true to its name. 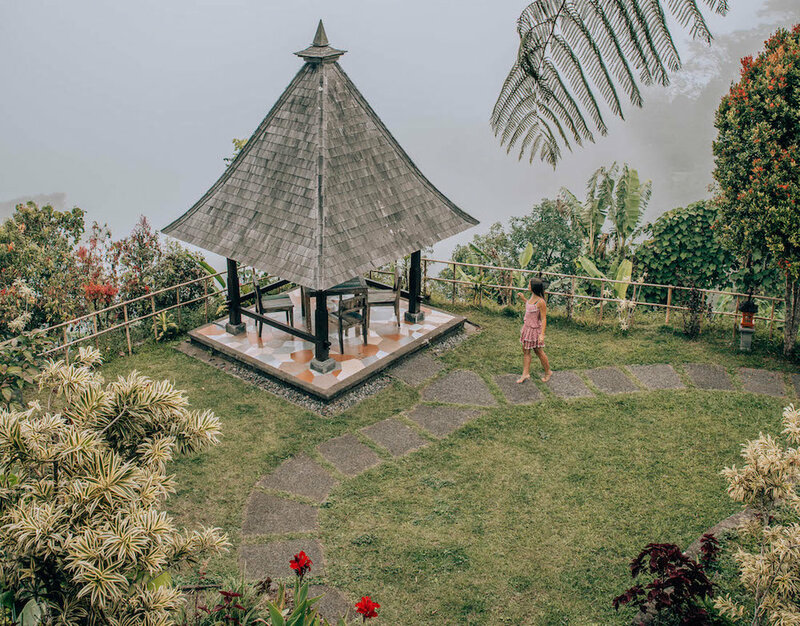 Even in thick fog, The View is beautiful, with a traditional Balinese interiors, pretty manicured gardens with a gazebo, and a rooftop viewing deck where you can watch the mist drift along. Here you can enjoy some delicious Balinese cuisine as well as some Western options, all accompanied by fresh coconuts. This restaurant closes at 6pm, so it's best for lunch or an early dinner. I didn’t have a chance to visit Ngiring Ngewedang, but it has great reviews and looks beautiful from the outside. Like The View, you’ll find Balinese favorites and some Western options here, in a slightly more modern setting. The restaurant is perched hillside along a sharp curve on the main road, giving you spectacular views of the hillside if the fog doesn’t get in the way. Note that, also like The View, this restaurant closes at 6pm. If you’re looking for a restaurant open for a late dinner, Don Biyu is one of the few options in the area. Thankfully, this place is quite tasty and has a charming Balinese ambiance with twinkly bistro lights and beautiful grounds. Don’t miss the black rice pudding with coconut milk for dessert: it’s made with real palm sugar and is totally decadent. Worth every calorie. For a multi-day adventure up north, you'll need to of course find accommodation. Munduk is a good central location to stay, but unlike the more popular Bali destinations, the options here are limited. Here are some ways to prepare and accommodation recommendations for your stay. Most of the accommodation options in north Bali are smaller, basic guesthouses. They are extremely affordable but expect only the basics, and perhaps no English-speaking staff. Unless you’re staying at one of the nicer hotels, I’d recommend ensuring there is an English-speaking staff member available throughout your entire stay, or bring your own English-speaking driver. It can be frustrating to have miscommunications about times and other details when traveling around the sites in the area, so plan in advance. For a luxury option, get a room at the Sanak Retreat. The stunning hotel is located in the middle of a rice paddy and has an on-site spa and restaurant serving farm-to-table meals. It’s a hidden gem in North Bali, but expect much higher prices than elsewhere in Bali. Another option is Munduk Moding Plantation, which has an epic infinity pool made famous on Instagram. For a well-maintained budget option, check out I Guci Home. I stayed there during my Munduk trip and had an overall good experience, with some caveats. The pros: Despite some noise and some more limited tourism services, I Guci Home is still a great option for a budget stay in North Bali. There are only two impeccably decorated bungalows on site and, when I was there, the second was empty, so my friend and I had the whole place to ourselves. It really has the feel of a luxury resort transported to a budget location with budget services/amenities, but at only $50/night, it’s a pretty good deal. The cons: it’s set along a busy road so there is some noise in the evenings and during the day, and the neighboring mosque's early morning call to prayer is pretty loud. Most of the staff do not speak English, but there was one English-speaking manager who was available to coordinate scheduling and resolve issues at pretty much all hours of the day/night via text. Although the guesthouse serves meals, the options are quite limited so we chose to find food elsewhere. The guesthouse will help coordinate transportation to nearby sites and to restaurants for a fee. I hope this article has inspired you to make a trip to North Bali on your next visit to the island. Whether it's for the waterfalls, water temples, hot springs, or just to retreat to a more serene, untouched part of the island, North Bali won't disappoint. Follow this guide for tips on where to go & what to do, food & accommodations, and more, to be sure you make the most of your North Bali adventure. Have you been to any of these places in North Bali? Any other spots to recommend? Let me know in the comments below!